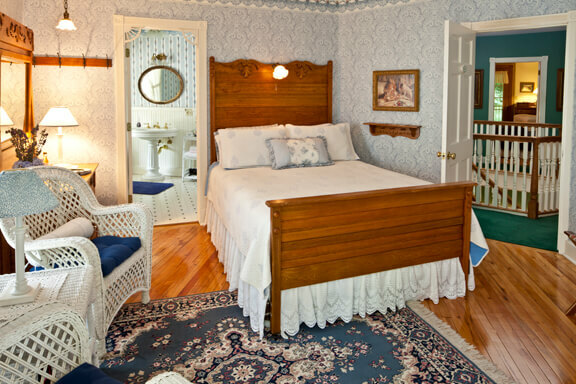 The Hexagon House Bed and Breakfast is the perfect romantic destination. Enjoy a quiet moment inside by the parlor fireplace, or share a bottle of wine under the stars on our spacious wraparound porches. 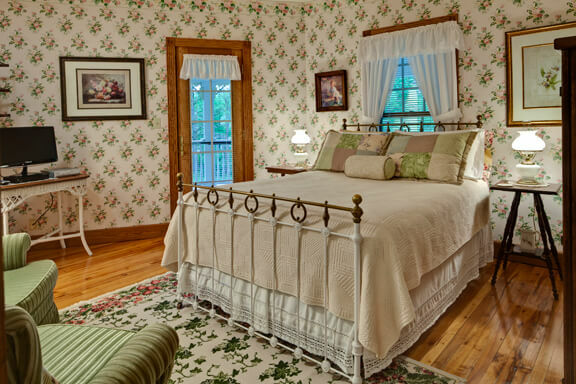 Our Lake Michigan bed and breakfast is one of West Michigan's premiere historic inns. We are a short walk from the quaint village of Pentwater, Lake Michigan and Charles Mears State Park. It is minutes away from Ludington, the Silver Lake Sand Dunes, and Big Sable & Little Sable Point lighthouses. 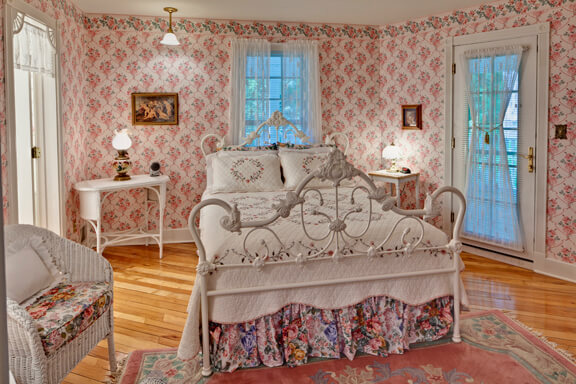 The Hexagon House B&B is the perfect romantic destination. 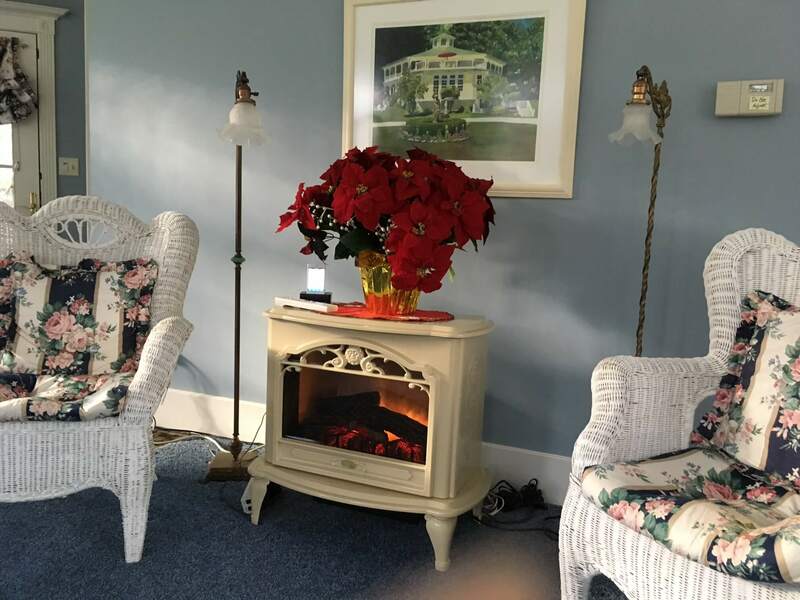 Enjoy a quiet moment inside by the parlor fireplace, or share a bottle of wine under the stars on our spacious wraparound porches. A Pentwater tradition is dinner in the village followed by a walk to the Lake Michigan beach with an ice cream cone for sunset. After the colors fade from the western sky, complete your perfect day by gathering around a flickering fire at our fire pit. No trip to Pentwater is complete without a shopping spree to the village art galleries, antique shops and boutiques. If the mood strikes you, let us arrange a round at one of our Lake Michigan golf courses or a quiet beach picnic. 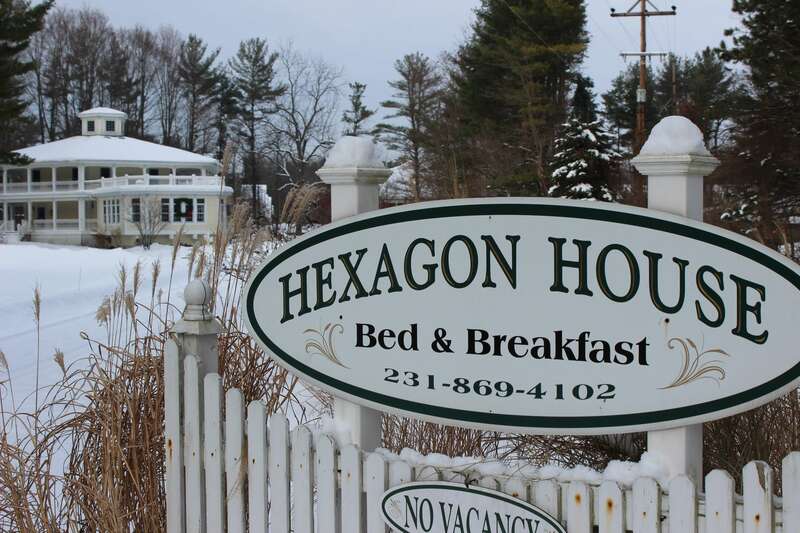 The Hexagon House in Pentwater is an ideal destination for your Lake Michigan bed and breakfast vacation. Several historic lighthouses are within a short drive of Hexagon House. Among the most notable, Little Sable Point Lighthouse is just 27 minutes south at the southern edge of Silver Lake. Constructed in 1874, the light stands over 100 feet tall. Just 30 minutes north of Pentwater, Big Sable Lighthouse stands 112 feet tall. Hexagon House is surrounded by a nature lover’s paradise. Enjoy the sugar sand beaches and pristine waters of nearby Lake Michigan. From the Hexagon House porches, watch as eagles soar overhead and hummingbirds flit from flower to flower. Soak in the views from Old Baldy Dune and Nature Trail in nearby Mears State Park. Or savor quiet solitude on the trails of Pentwater Pathways. 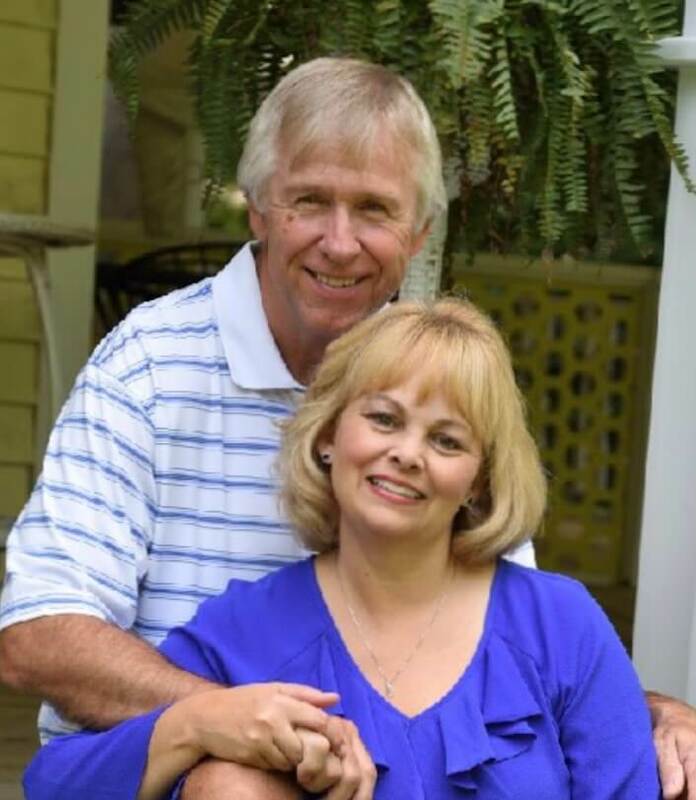 We offer special wedding packages that include bridal party accommodations, use of the grounds, champagne, cake, music, breakfast, and even our own in-house officiant: Tom Hamel, of My West Michigan Wedding. Let us customize a package for your nuptials. 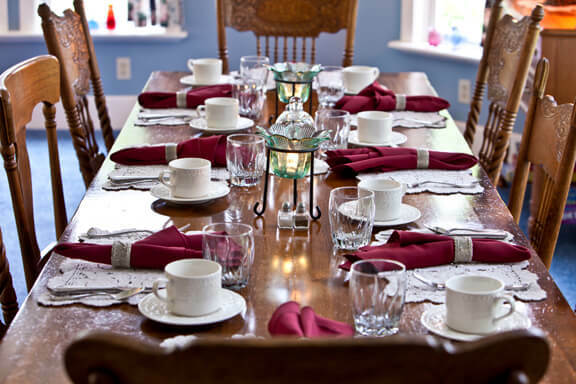 We can accommodate approximately 30 guests for a wedding and reception. 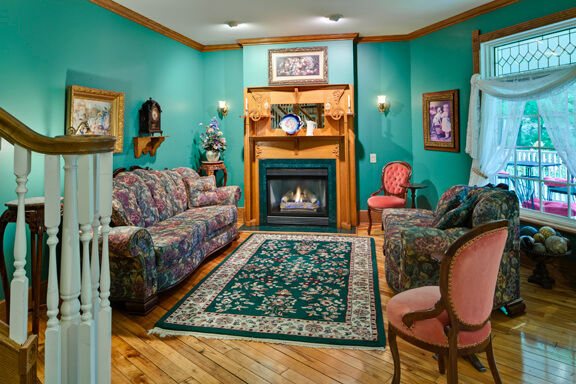 With a whole-house rental we can accommodate 10 to 12 lodging guests. 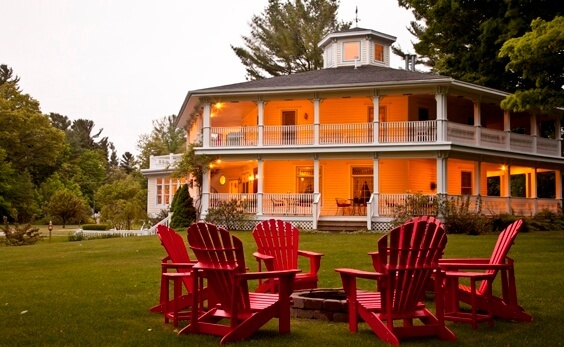 You’ll have views of Pentwater Lake from our porches and grounds. With a brief five-minute drive, you will reach the sandy shores of Lake Michigan. En route, you will pass two local full service marinas, Snug Harbor and Charlie’s Marina. 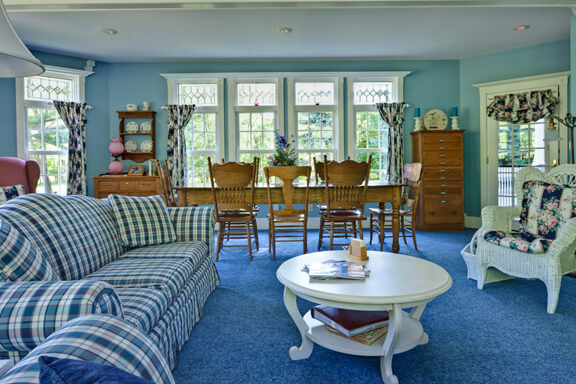 As you drive through quaint downtown Pentwater, you will be treated to the sight of colorful sailboats, traditional fishing vessels, and pristine yachts. Parking, concession stand and public restrooms are available at Mears State Park. A nominal fee or Michigan Recreations Passport gains you entrance into this beautifully maintained, visitor-friendly state park. From Mears State Park to Silver Lake, Oceana County becomes ablaze in a kaleidoscope of vibrant reds, golden yellows, and bold oranges from late September through October. Each September, Downtown Pentwater welcomes more than 100 vendors to its Arts & Crafts Fair on the Village Green. Visitors can browse among goods ranging from handmade crafts to valuable antiques. Oktoberfest features food, live music, and a classic car and hot rod show. From Pentwater Lake to Hamlin Lake to Pere Marquette, the winter landscape comes alive as area anglers vie for their coveted spot on the frozen ice. Pentwater is also home to Pentwater Pathways, a cross-country ski trail boasting four loops totaling 15 miles. The pathways wind through gently sloping hills, pine trees, and dense forest.